Induction heating can completely change the energy budget of an exoplanet and even melt its interior. In a study published by Nature Astronomy an international team led by the Space Research Institute of the Austrian Academy of Sciences with participation of the University of Vienna explains how magma oceans can form under the surface of exoplanets as a result of induction heating. When a conductive material is embedded in a changing magnetic field, an electrical current is produced inside the body by a process called electromagnetic induction. If the electrical current is strong enough, it can heat the material in which it flows because of electrical resistance. This process called induction heating is widely used in industry to melt materials and at home to cook using induction stoves. An international team led by the Space Research Institute (IWF) of the Austrian Academy of Sciences (OeAW) with participation of the Department of Astrophysics of the University of Vienna was inspired by these examples. 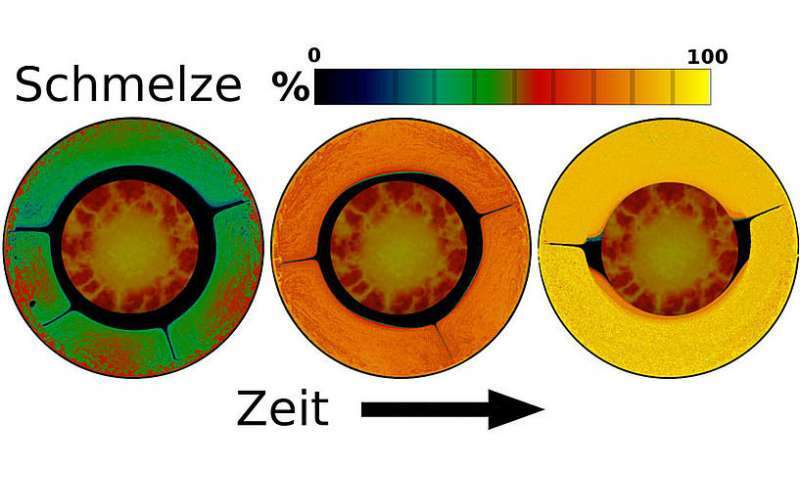 "We wanted to investigate if induction heating can play a role on a much bigger scale," explains first author Kristina Kislyakova. "We were particularly interested in planets orbiting stars that have strong magnetic fields." These stars can rotate very rapidly, which causes the magnetic field at the planet's orbit to change rapidly as well. In such cases, induction heating can take place inside the planet. The team studied low mass stars that exhibit some exotic characteristics in comparison to our Sun. They are much smaller and dimmer. Some of them rotate very fast and possess magnetic fields hundreds of times stronger than the solar one. A good example of such a low-mass star is Trappist-1, which hosts a big family of seven close-in rocky planets, three of which may have liquid water on their surface. This planetary system is a top candidate for the search of Earth-like planets. Kislyakova and her team have calculated the energy release inside the Trappist-1 planets due to induction heating. "We have shown that for some of the planets, the heating is strong enough to drive enormous volcanic activity or even lead to the formation of a magma ocean beneath the planetary surface." As we know from Earth, strong volcanic activity can have a severe influence on a planet's atmosphere. "Therefore, induction heating can strongly influence the habitability of an exoplanet," adds IWF co-author Luca Fossati. This new study shows that this effect has to be taken into account when studying the habitability and evolution of planets orbiting low-mass stars. A microwave plasma from a huge solar storm event could melt the surface of Earth down to at least 2 kilometers, might explain how the Deccan and Siberian traps formed, as geologists have yet to be able to locate any vent sources, and there would need to be many of them to form the traps. When thinking of electrical/plasma events affecting planets/moons, we need to think really big, by puny human standards anyway.